You can use either suitcases or strong cardboard boxes, or a mixture or both. You can use holdalls, rucksacks, hard or soft suitcases, just make sure all straps are tucked in or removed. Do not lock the suitcase. Customs and/or the courier may need to verify the contents of your items. Please note that the packaging (the suitcase) is not covered by our compensation cover, so please do not use fragile or expensive suitcases. We recommend you tape over any handles, etc to protect them. Please make sure you use double walled boxes and not single walled (crisp style) boxes. Please do not use plastic boxes as they are very brittle. If you need to purchase boxes we have some recommendations here. 2. What can I send? You can use My Baggage to send most personal effects, however there are some items you cannot send. We have a list you can check here. 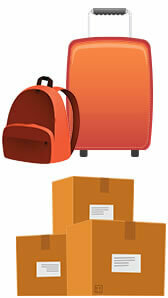 Some popular items we do not recommend sending are: fragile items, liquids or aerosols (deodorant cans). For electrical items, such as TVs, we recommend only sending in the original manufactures packaging and these items are not covered by our compensation cover. Musical instruments can be sent, we recommend only sending in travel cases and these items are not covered by our compensation cover. You can send up to 30kg per item. Please make sure your item is not over this weight as the driver may refuse to collect an overweight item (unless you have paid extra for a different service). 3. How do I pack it all up? Please package up each individual item in some form of protection, such as bubble wrap, cardboard, etc. Use clothes to space items out and spread heavy items, such as books across the whole package. Do not over pack the item. We have a very high weight allowance of 30kg, but please only pack what your suitcases or cardboard box can safely hold. If an item splits it can severally delay your shipment. IMPORTANT: There are some items you cannot send on our international services, popular items that are prohibited include; perfume, aerosols (deodorant) and nail varnish, please read our prohibited items list here, items containing these items may have to be returned. If you are using a cardboard box please use plenty of packaging tape (brown tape), do not use sellotape. Do not overlap the flaps of the boxes, this makes the box very weak and can spill the contents very easily. If you are using a suitcase please make sure the suitcase is closed and all handles, straps are taped down. Please do not lock the suitcase, as your suitcase may be returned to you. Customs and/or the courier may need to verify the contents of your items. Attaching your labels to the packaging is the most important part of the process. You need to ensure all labels are securely attached. Please print your labels off from My Orders or from your email. Some labels only become available the day before collection. 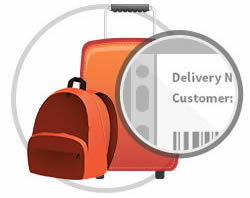 My Baggage cannot be held responsible for any loss or delay if your labels or the courier’s shipping labels come off in transit or the labels we provide are not attached. Remove all previous labels from any item you wish to send. Leaving old labels on any items may lead to confusion and may result in your item being delayed, mis-sorted or returned to the collection address. Please do not attach your labels with tape alone, as your labels are likely to fall off and could result in your item being delayed. Method 1: Insert your labels into poly pockets, tape closed and tie them onto your suitcase with string. Then tape the poly pockets to your suitcase. Make sure the pockets are tied on. Method 2: Attach your labels with tape and then cover your bag with cling film. If you have two labels just attach a label to each side of your bag and then wrap your bag in cling film, wrap the film around twice. This will stop the labels falling off and protect your suitcase while in transit. If sending a suitcase we recommend inserting a label or a note at the top of your suitcase with your name and full delivery address incase your labels do come off. 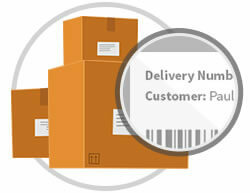 Simply attach the labels like you would to a normal parcel. Use tape and make sure each label is attached securely. Do not block any information with the tape.